Density is defined as the mass of a unit volume of some material. The term unit volume means the amount contained in one volumetric unit of measurement: one cubic foot, one liter, or one milliliter, for example. The density of pure iron, for instance, is 7.87 grams per cubic centimeter (7.87 g/cm 3 ). That statement means that one cubic centimeter (1 cm 3 ) of iron has a mass of 7.87 grams. Density is an important measurement because it allows for the comparison of the heaviness of two materials. Rather than asking, "Which is heavier: iron or Styrofoam™?," the proper question to ask is: "Which is more dense: iron or Styrofoam™?" This question is more appropriate because it asks about a comparison between equal amounts of two different materials. 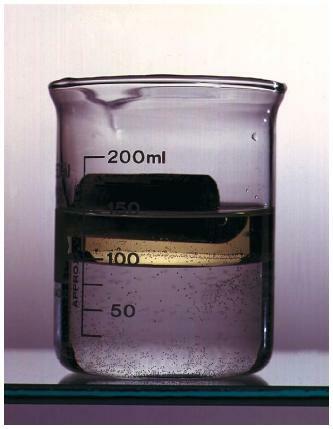 Another form of measurement closely associated with density is specific gravity. The specific gravity of a material is the density of that material compared to the density of some standard. For solids and liquids, the most common standard is water, whose density is 1.00 gram per cubic centimeter. The specific gravity of iron, then, is its density (7.87 grams per cubic centimeter) divided by the density of water (1.00 gram per cubic centimeter). You can see that the numerical value for the specific gravity of a solid or liquid is always the same as that of its density. The reason is that the divisor in every case is 1 gram per cubic centimeter, the density of water. For iron, the specific gravity is 7.87. The only difference between density and specific gravity for solids and liquids is that specific gravity has no label. In dividing 7.87 grams per cubic centimeter by 1.00 gram per cubic centimeter, the labels divide out (cancel), leaving only the number. The specific gravity of gases is somewhat more difficult since the most common standards are air (density = 1.293 grams per cubic centimeter) or hydrogen (density = 0.0899 gram per cubic centimeter). The specific gravity of oxygen using air as a standard, then, is its density (1.429 grams per cubic centimeter) divided by the density of air (1.293 grams per cubic centimeter), or 1.105. Using hydrogen as a standard, the specific gravity of oxygen is 1.429 grams per cubic centimeter ÷ 0.0899 gram per cubic centimeter, or 15.9. GOOD SOLUTION IN THIS TOPIC IS VERY IMPORTENT TOPIC IN CIVIL ENGINEERING DEPARTMENT. Air fossils and water bowls co- relate with temperature even bowls form from the surface of ground fossils were relate with metrics of compound materials.